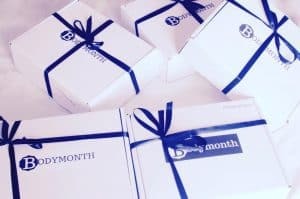 I have tried quite a few subscription boxes, from food and beauty to fandom/geeky boxes and stationery/lifestyle subscription boxes and I’ve loved a lot of them – I especially love the mystery that comes with subscription boxes. However, most of the time there will be brands that I haven’t heard of or products that I won’t use and that’s where the BodyMonth box comes in! There’s a standard box for £19 per month and then there’s the box I have which is the premium box which is £29 per month, all of which contain toiletries and other little goodies; all of the items I received the the September Premium Box are so useful, handy and I will use literally every single item in the box which is such a rarity for me with subscription boxes. The September Premium box contains a whopping eleven full size products! How amazing is that, especially as most beauty boxes contain sample sizes on the whole. 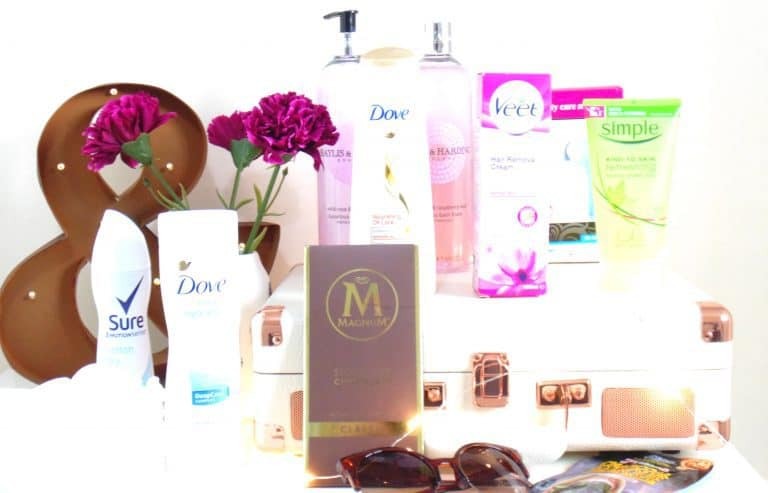 There are nine beauty items and two ‘lifestyle’ type items in the box. The items range from shampoo, body wash, skincare, beauty tools, masks, chocolate and more, all of which are from brands that I know and use. Let’s start with the skincare, the first skincare item in the September BodyMonth box is one I’ve tried before and loved, the Simple Kind To Skin Refreshing Facial Wash Gel. I use to adore Simple skincare as a teenager, it was amazing for my sensitive skin and I still recommend their products now. I also received another nostalgic product for me, the 7th Heaven Charcoal Mask; 7th Heaven is the new name for Montagne Jeunesse which is a peal off face mask brand that myself and my friends loved back in the 90’s and early 00’s. I have gone through so many of their masks growing up and just the packaging is so nostalgic for me – you can’t go wrong with their masks. The final skincare product is a 5 in 1 beauty care massager which looks a little like a cheap Clarisonic, I have the original Clarisonic Mia which was so expensive at £120 so I’m interested to see how this compares. Next up, the bodycare items, there are two massive bottles of the Baylis & Harding England Wild Rose and Raspberry Leaf shower creme and bath foam in the box which smell amazing! Both products, to me, smell like Turkish Delight which I love. 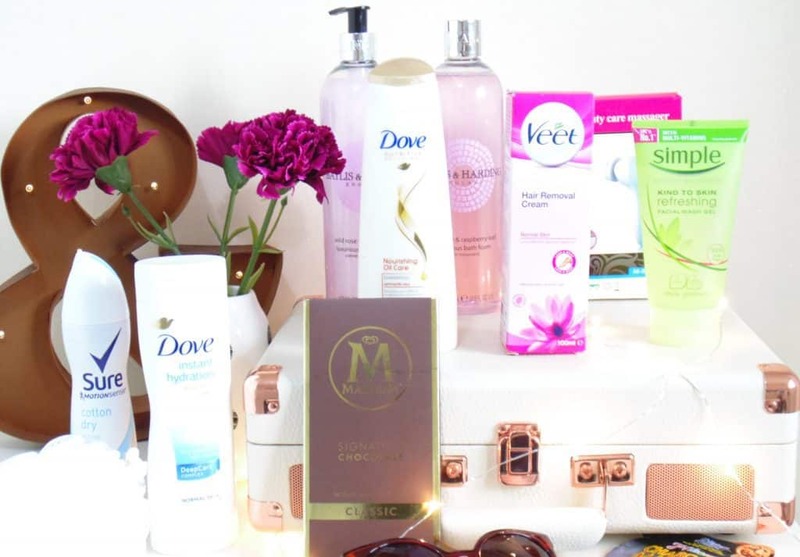 I also received two products from one of my favourite highstreet brands, Dove, the Nourishing Oil Care Shampoo and the Instant Hydration Lotion. I love the lotion, it has that gorgeous, clean Dove scent and the shampoo smells equally gorgeous. I’ve tried a lot of Dove products over the years but I haven’t tried their haircare items so I’m excited to give it a go. The box also contains another very handy item, the Sure Cotton Dry Motion Sense Anti-Perspirant which smells great and it’s always useful to have a spare on hand. 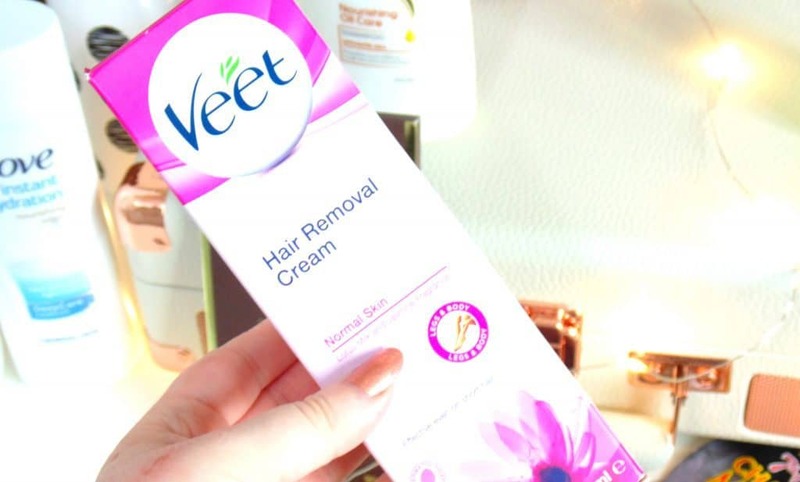 The last bodycare item, is the Veet Hair Removal Cream which I use to use all of the time in college as I was always cutting myself with razors and hair removal creams are so much simpler to use and they don’t irritate my skin as much as razors can. I’ve already used this and it’s just as good as it was back then! 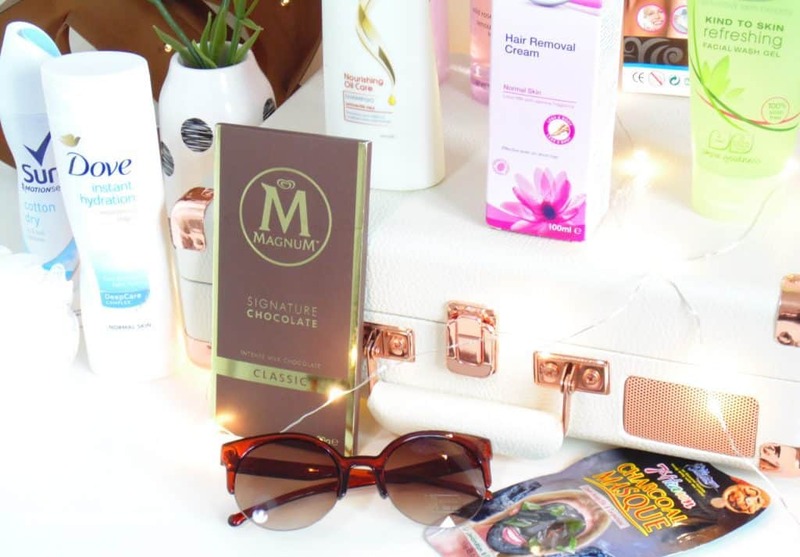 The last two items are more ‘lifestyle’ products, the first was very exciting – the Magnum Signature Classic Milk Chocolate Bar…How did I not know that Magnum made chocolate bars! I’ve already tried this bar and it’s so good; it’s perfect to snack on while watching Bake Off (let’s not talk about the recent trauma regarding The Great British Bake Off!). Last but not least there was a cute pair of sunglasses in the box which will come in very handy as I’ve been driving a lot more and I have to wear sunglasses constantly so now I have a pair that I can leave in the car. Overall, I don’t think I’ve been as initially impressed by a subscription box as I have been with this one for a while. I think the concept of a toiletries/beauty box that contains items that we all use all of the time is amazing and I don’t know why someone hasn’t thought of it before. The box contains so many amazing full size items that I will use and I loved the addition of the lifestyle items too. It’s a monthly box which is fantastic as I usually use up toilettes within a month or so, so I now have backups that I can use. How would you rate Bodymonth ? Rating: 3.2/5. From 6 votes.